*The current specification SP-110-1996 does not address the new technology of press end connections. Other than this exception, the valve meets the design criteria of the specification. 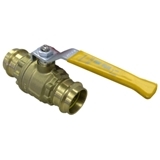 It is recommended to use the valve in open/close applications, not mid, or modulating, services. In addition, the valve should be operated at least twice a year.